This pregnancy has definitely thrown my digestive system for a loop. I am not able to digest my wonderful raw milk. I can digest it if it has been fermented in one way or another though (yogurt, kefir, buttermilk, etc.) I can also do soured cream, which is super nice; especially on taco night. I also have to give up beef for a season. Such a bummer, since we purchased a 1/4 100% grassfed cow this year. But God is still good and I really can’t complain. Things could and have been worse on my dietary restriction list. 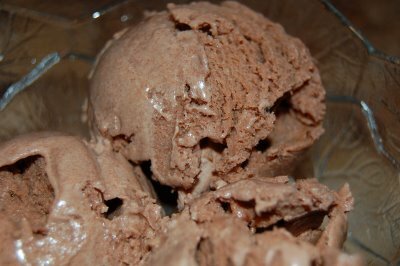 It has been a while since I have had homemade ice cream, since everyone else in the house can have raw dairy just fine. But since yesterday was my birthday and my sweet daughter made me a sprouted chocolate cake with a beautifully decorated top (which I would have taken a picture of, but a certain 3 year old smeared it); I just had to make some ice cream that I could enjoy to go along with it. Blend on lowest setting for about 30 seconds. Pour ice cream into ice cream maker and follow its directions.